*Gift certificates make great gifts! 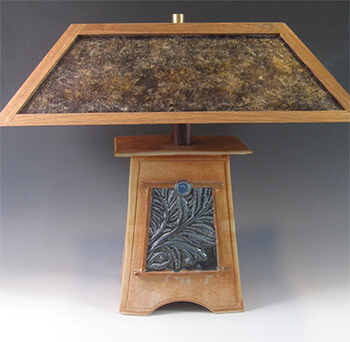 Order Your Custom Craftsmen Style Lamp! Custom built lamps and shades with brass fixtures can be tailored to your preferred design needs. Lloyd is featured in Newburyport Magazine's Winter 2016 issue! Lloyd is featured in Paradise City's June 2015 edition of Art Buzz! View Lloyd's lamps as seen in Northshore Magazine! The 2 Rivers Ceramic Studio is a fully equipped, cooperative studio with facilities for the independent clay artist and beginner student. The goal of the studio is to provide a professional working atmosphere for ceramic artists of all abilities. A 40-cubic-foot, gas-fired reduction kiln is the centerpiece of the studio. There are day and evening classes for adult students wishing to pursue the clay arts at a variety of levels, from beginner to advanced. Located in Newbury just a short distance from Rt. 1 (Newburyport Turnpike), the studio is convenient to the North Shore and Merrimac Valley.